Have you heard of that man who burnt his own house to teach a mouse, which was destroying his grains, a lesson? No? 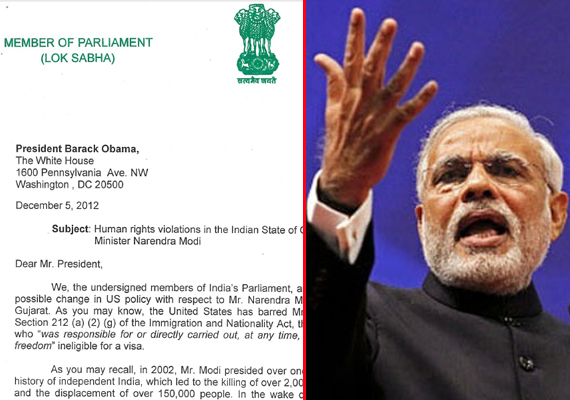 Then have you heard about those 65 members of parliament, in their tranquil attempt at appeasement and dirty tricks have written to Barack Obama, urging him not to grant VISA to a certain Narendra Modi? Do you see resemblances between these two illustrations? While a man scorched his own house while he assumed he is taking requite against the mouse; here we have a cluster of idiots who in order to massage their own selves, have actually crooked themselves to an international amusement park. Now, how the progression of restoration of oneself, from absolute nut cases to an amusement park transpired? Someone going by the name Mohammad Adeeb started a signature crusade amid his venerated collogues of the parliament and shoot across a letter to Obama, beseeching him to keep on denying US VISA to Narendra Modi. Now, you may wonder what the detriment there could be in this letter writing isometrics. Here is the thing. Someone writing a letter to Obama or for that matter to anyone is absolutely fine as long as it doesn’t fetter the nation’s stand, on international forums. By lettering to Obama, thereby entreating him to repudiate VISA to a fellow Indian is not only surreptitious but also looks whole lot deplorable; knowing the person they are demurring is a democratically elected chief-minister of a state. 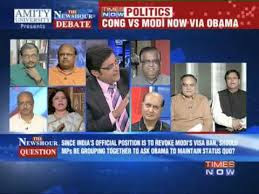 In yesterday’s newshour, we had an array of people. From those who have signed and assenting they are morons to those who alleged to have signed but repudiating they are morons. And as usual we also had a set of buffoons who are self-proclaimed cognoscente and find it an onus on them to blabber their pennyworth on every damn topic. One gentleman, whom I don’t find worth remembering his name, has his own version of ‘freedom of opinion’ nonsense. As per him, his opinion is that, Modi should be deprived of a VISA to USA hence he took it as a moral liability to sign on a letter that is affiliating with his view point. To add to his flimflam, this highly hidebound man asked all to elucidate, if as an individual, is he privy to have an opinion or not. It continues to bamboozle me, how on earth we keep on electing such comedians to our parliament, again and again. How I wish I was there in the studio to let know this self-serving idiot that writing on a government supplied letterhead, no more remains an act of individual profane. The moment something gets scribed on a government supplied letterhead, it becomes an endorsed document, not a facetious game of internal gimmickry. If this moron, along with 64 others of his ilk were that perturbed with Narendra Modi’s US VISA prospects and wanted to treat their dissatisfaction a pure individual interpretation then they shouldn’t have used government stationary. Let alone making it an official stand, writing to an alien state head, even at a personal level, to deny VISA to a fellow countryman, also looks flabbergasting. When the embargo was initially structured back in 2005, the official stand of our government was in line with the standard diplomatic protocol. Though out of exhilaration the entire lot of Congress might very well have consumed half the grog of the city pubs that night, still as part of claptrap, an official protest was logged with the then US administration. We should object every time we see one of our democratically elected representatives or for that matter any common citizen is ill-treated by a foreign country and I don’t see anything great or out of turn coming from our Govt here. Insult and quite deliberately at that, to an Indian no more remains insult at an individual level but an insult to the nation. In a government which even leaves a lot of people, priminister and down, sleepless on the news of an incarcerated terrorist in Australia or a Bollywood actor at Newark; this imprudent reaction of US government didn’t bring the amount of protest that should have been there. But that is fine, at least they logged a complain, which I otherwise thought they might never. Nonetheless, our official stand on the whole issue of VISA denial to Modi remains pretty much there. Now, how this is judicious to have a gang of morons who take it on themselves to bypass our MEA and government’s stand and post letters left-right-and-center? And we have this scoundrel who is on TV and claiming it to be his personal opinion? Since when, personal opinions started to sabotage the nation’s stand on a particular issue; that too on international platforms? But it seems our politicians have hijacked the whole notion of national unity long back. In a mission to prove they are a bigger secular than the bald head sitting beside them, our politicians, led by those from the Congress have gone into a habit of insulting national ethos at an alarming regularity. Little did these scoundrels and the parties they belong understand, on an international podium it is our national identity and the veracity of it which stands paramount; much, much more than personal and political agendas. This letter writing even looks more spurious as now we have politicians, who alleged to have signed are coming forward and denying of even seeing such a letter ever, let alone signing their consent on the same. It scales in to either of the two possibilities. Either the morons comprehended little late that, in the course of secularizing themselves to a new high they in fact have shot themselves in the foot or the whole letter is an act of high-end falsification. Or maybe the idiots never thought their nonessential would ever see the light. Now that the clowns are anything but exposed at their anti-national schemata, people are seen running all over the place for cover. We are seeing politicians claiming their virtuousness quicker than the time they might have taken in signing them at the first place. That said, if, for once we can dare to believe the likes of Sitaram Yetchury, the whole letter hubbub looks downright an act of treachery against the nation. Isn’t the denial of a majority of the alleged signatories’ calls for an exhaustive probe? Shouldn’t the jackals like Mohammd Adeeb be booked for falsifying so many elected representatives and abusing government’s name by using official stationary? Can Miera Kumar utter something beyond her standard ‘Baith Jaiye, Shant Ho Jayiye’ jibes and calls for the ouster of pranksters like Adeeb till the enquiry gets over? But looking at the interest that Congress harbors in slandering Modi, are we expecting rogues like Adeeb ever be taken to task? Do we expect a government, which may very well be rejoicing the brushoff to Modi covertly and only pretending to object any such ill-treatment, can ever rise above its cocooned and tapered mindset and keep nation’s interest above theirs? Not much, I guess by looking at the morons like Sanjay Jha. He is a so called spokesperson of the Congress party. Isn’t he? He is another of those ignorant urchins who doesn’t know, the utterances of a spokesperson is more-or-less taken as an official line of the party. And look how jubilated the ragamuffin is; so much so to even fissure jokes on this pan-India insult. That said, I still give it to Congress in one front. They must be congratulated for gathering all the clowns of the world as part of their lie peddling and communication team. Jokes apart, when Rahul Gandhi going to conduct a workshop on letter writing skills, the Mahatma way? I am sure, in coming days the least they would be obligated to do is to write similar letters (with or without forged signatures) to all the state heads of the world; including but not limited to Somalia, Tahiti and Uganda also. Dei, Dei, Dei... Rascals thought their nonsense would never be exposed. Now that they are caught with their Dhotis down, all are cantering around, proclaiming innocence. Bloody rogues and self-serving morons. its humiliating for a nation of a billion to churn out such uneducated unfit morons who sit in the parliament acting"Mr know it all", they not only insulted our nation but displayed their slave mentality and validated 1000 yrs of foreign rule. next thing u know will be Arnab inviting obama on newshour before election to enlighten our public of secularism and other textbook virtues which they wanna sell, to come back to power and repeat the cycle of loot and plunder. they r acting like pimp of our nation and filling their pockets. kudos to all 65 bharat ratnas with 21 toppo ki salami + my salutes from the rear. disclaimer: All characters appearing in this work are real. Any resemblance to real persons are intentional, which is meant to be taken seriously by our citizens as such acts affect national pride and standing. As usual the articles on Being Cynical are a real eye-opener. Keep up the good work . We badly need patriots like you to save Hindustan !! Why don't you write a topic on Sanjay Jha's weak defence on Rs.5/- and Rs.12/- food available in Delhi and Mumbai respectively. And could you get the telephone number of this moron so that i could call him and give him a piece of mind. Tried many times calling him up thru Times Now and blast this moron last night. Absolutely. For once I thought the usual PAranoid NoGoswami was at his belligerent best, humiliating Sanjay Jha. I am yet to see anyone humiliated as was Sanjay Jha last night. It was something. And for a change a topic that was simple, but, very very powerful that exposed the Congress and its louts in all its shame. Great piece. If all the sane headed people in the country take it as a personal responsibility to educate 10 others (the real aam admi who is a prey to the money / caste / religion based politics) and prevent the Congress from coming back to power, that would be wonderful service to nation. Check the names in this website.